Say what you will about Oregon’s unique kicker law — good, bad, indifferent — but it is enshrined in the state constitution and it is the law. When our office’s revenue forecast is off by 2% or more, everything above the forecast is returned to Oregon taxpayers (key point: including that first 2%.) We also pay the kicker out the same way we take the revenue in, based on one’s tax liability. So the more one earns, the larger one’s kicker. Our office included the following table in our presentation to the legislature to both illustrate this point and to provide estimates of what the typical taxpayer should expect, based on the latest forecast. The specific numbers will change when our office certifies the kicker in another couple of months. While the above details the expected kicker across the income distribution, an interesting question is how much of it will be spent. This exact question was asked at the most recent legislative hearing and forecast release. While our office did not have a specific number at that time, we do have an estimate now based on some recent research. First, however, a bigger point that we did make at the hearing. Lower income taxpayers and households spend a higher fraction of their income than do high income households. Similarly, savings rates are much higher for high-income households than for low-income households. So giving $100 to different taxpayers at different points along the income spectrum result in different numbers in terms of spending. One potential issue along these lines is the difference between average propensity to consume (think of savings rates vs spending rates) and the marginal propensity to consume/spend — if someone were to hand you $20 today, how much would you spend? 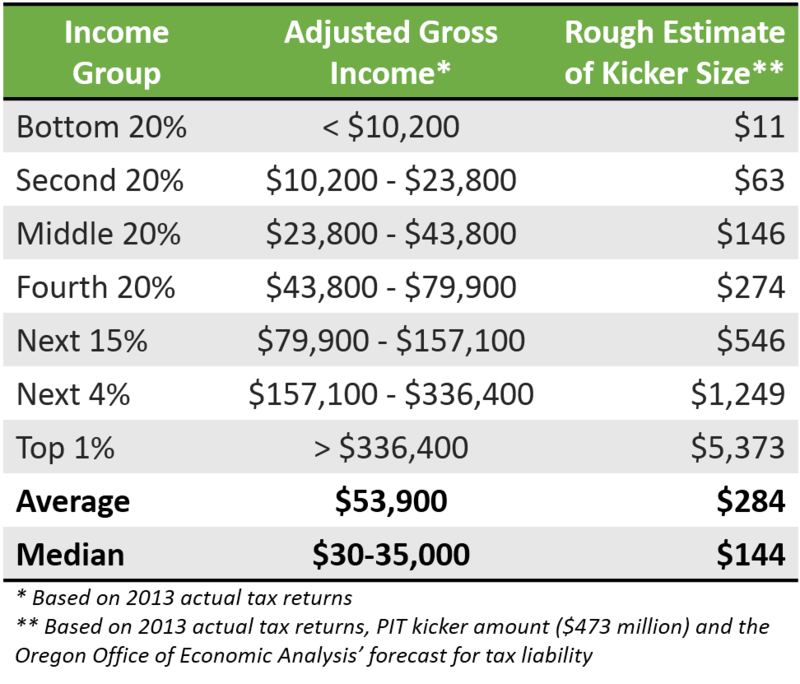 Given that kickers occur on an infrequent basis, it’s hard to argue that taxpayers plan on receiving them in advance, or build them into their household financial plans. Milton Friedman’s permanent income hypothesis certainly plays a role here. As such, recent research on the marginal propensity to consume across the income distribution helps shed light on this question. The estimates* of spending the kicker are shown below. Such findings may be a surprise. 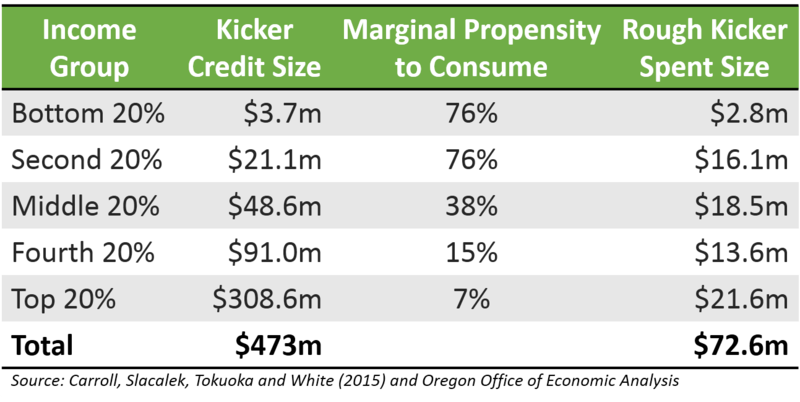 Just 15% of the kicker is expected to be spent, at least pretty quickly. In the paper, different model results peg the figure between 10 and 20%. Of course these numbers vary across the income spectrum as well, with those in the bottom half spending about three-quarters of their kicker while those at the top spending less than 10% of theirs. However a few additional things are worth mentioning. First, all $473 million (the final figure will differ) will be returned to taxpayers via a credit on next year’s tax return. Much of it will go towards savings and/or paying down debt, most likely. Second, given that the kicker will be a credit that results in a larger refund or a smaller final payment, and not a check in the mail around the holiday season, how does this change consumer behavior? We don’t know, but it does seem to imply a smaller spending share, particularly for those now owing a smaller final payment. For a middle-income household sending in a final payment of $150 instead of $300, how much of the $150 kicker will they spend? Behavioral economics in general suggest not much. Humans react significantly different to losses than to gains. Finally, with all that being said, much of the kicker will be eventually spent over time. This research indicates the kicker may not pack much of a punch initially, however over a longer period, the kicker will certainly be factored into household finances and spending. * The model results in the paper do not explicitly lay out the marginal propensity to consume by quintile, but rather by various segments of the population (bottom 60%, top 20%, top 10%, etc.) The results shown in the table are my own estimates based on the published research, but made to ensure they sum to the total and published figures. As such, it is unlikely that both the bottom 20% and second 20% have the exact same MPC, however I am unable to determine the differences given the published results. This detail is unlikely to significantly impact the overall findings. Regrettably , at best you are only addressing part of the equation. If the Legislative Assembly voted not to spend the money on a tax cut (voted to override the kicker) how much of the money would be “spent” in our economy and how much in new money would flow into the state’s economy (e.g. federal Medicaid or health care matching dollars)? Even if they diverted all or some to a rainy day fund, all of the funds would eventually be spent here and some of them would draw into Oregon’s economy new money — and that new money is what has economic impact. Thanks Chuck. Luckily our office worries about the revenue side of the ledger and not the expenditure side. But your point stands. There is always an opportunity cost to doing one action vs another. Thanks, Josh. Well, I imagine in forecasting the economy — and resulting revenue from taxes — changes in federal dollars flowing into Oregon must be a factor. All else being equal, Oregon’s economy would have performed differently if Oregon had not chosen to expand Medicaid under the ACA.